It is a shot in the dark made in an ordinary night in an ordinary town and the bullet hit its target. 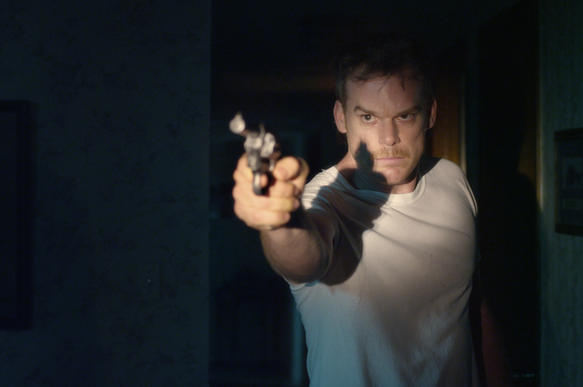 Jim Mickle’s film Cold in July is an engaging mystery that lends itself to the film noir genre. It works as Mickle weaves an intricate tale of suspense around the ordinary life of a husband and father named Richard Dane who reluctantly releases the shot in the dark on an intruder in his house. It’s 1989 in suburbia of East Texas, inhabited by law-abiding citizens with steady jobs who mind their business and find community at the local diner, but that murder, though carried out in self-defense, will turn Richard’s life upside down. Why? The intruder’s father returns to ask some questions. The answers will surprise even him! The jewel of Cold in July is the lighting, and Cinematographer Ryan Samul selects cold and warm prisms to convey pain, dispassion, and confusion; and desaturated colors to establish firmly the time period. The performances by well-seasoned actors are forceful. Sam Shephard playing Russell, evokes how deep a father’s angst falls even though the son is wanted by the police; Michael C. Hall who so easily plays Richard Dane, walks the line between the man who yearns for the return of everyday routine and a husband/ father who has to protect his family. You will appreciate Vinessa Shaw as Anne Dane as she drives her character through the burden that has been thrown on her shoulders. Oh, I have to mention the suave Don Johnson, who is Jim Bob. He makes a pair of cowboy boots speak a foreign language! Yes, he is that good! Cold in July plays through June 5 at The Ross.